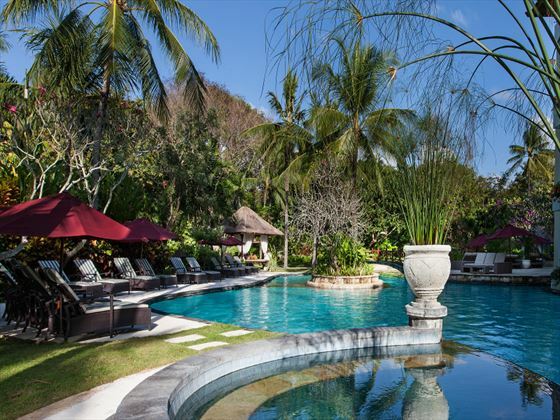 Nestled among the majestic Nusa Dua peninsula on Bali’s most beautiful beach, The Laguna Resort & Spa is a luxurious resort that evokes a wonderful sense of tranquility and seclusion. 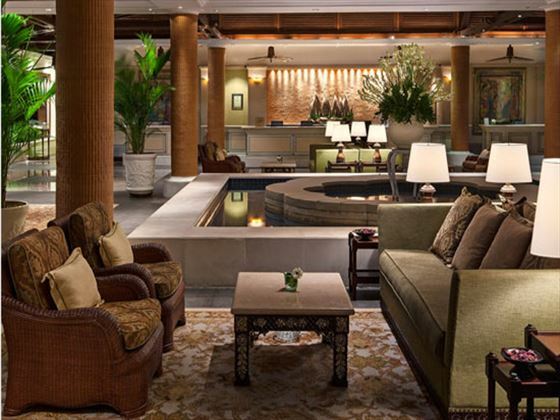 Covered in bright tropical flora, soaring palm trees and lush lagoons, the resort will feel like your own little paradise as you relax by the seven gorgeous lagoons and pools, enjoy a few cool water sports, and treat yourself to a soothing therapy at the lagoon spa. Delicious cuisine is another focus at The Laguna Resort & Spa. Cornerstone, for instance, serves up a sensational menu of homemade ice creams and decadent wines, whilst Arwana creates its innovative dishes with seafood selected straight from the market each morning. Meanwhile, KulKul Bar offers a tropical spot overlooking the ocean to sip on a refreshing cocktail, and there's marvellous afternoon tea entertainment on offer, too. The rooms here are opulent and stylish, all with a private balcony or patio looking out onto incredible views of the luscious gardens or the sparkling ocean. 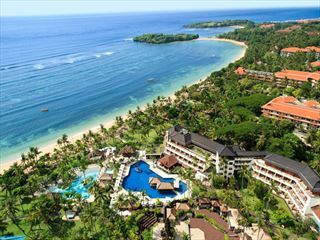 The Laguna Resort & Spa is nestled in the jaw-dropping Nusa Dua peninsula, offering a secluded and peaceful ambience, alongside a stunning backdrop of sugary sand beach and thick, tropical flora. Deluxe Garden/ Lagoon View - 36sqm king-size rooms with glass sliding doors that open out onto your own private balcony/patio. 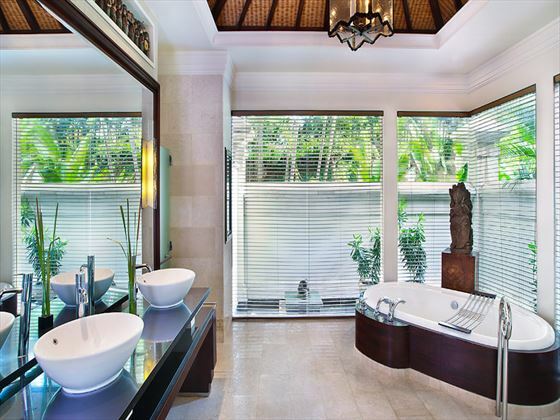 Featuring panoramic garden or lagoon views, and an ensuite with large bathtub. 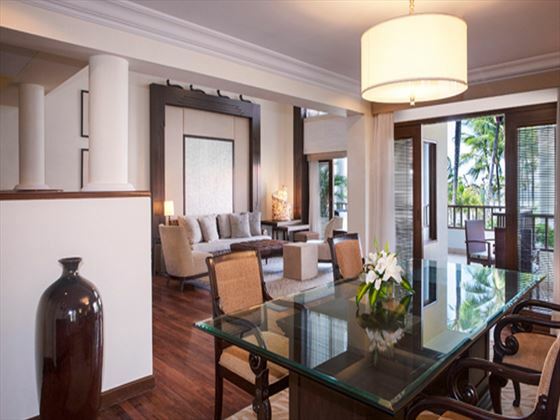 Deluxe Studio - 48sqm studios with gorgeous garden or lagoon views, a living area and an ensuite with large bathtub. Deluxe Lagoon Access - 36sqm king-size rooms with glass sliding doors opening out onto your private balcony/ patio, plus direct access to the expansive lagoon. Deluxe Studio Lagoon Access - 48sqm studios leading out onto the lagoon, complete with a living area and an ensuite with large bathtub. 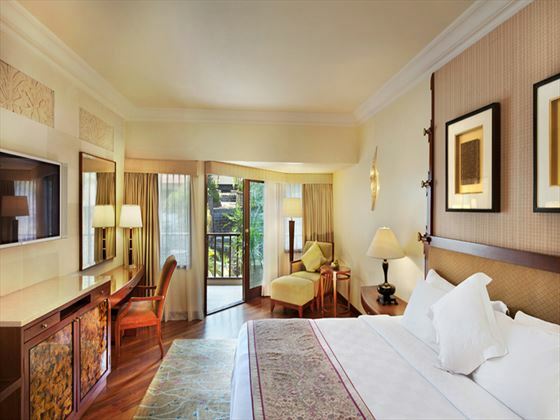 Executive Suite - 60sqm king-size suites, featuring an inviting reception area, a dining room, a spacious separate bedroom and panoramic garden or lagoon views. Lagoon Access Suite - King-size room with 60sqm of space, featuring an inviting reception area, a dining room, a spacious separate bedroom and direct access to the lagoon. 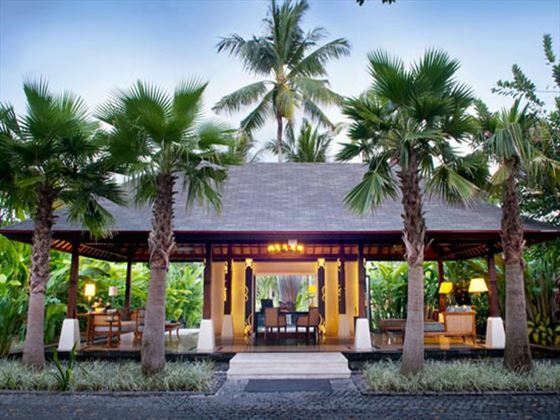 Hibiscus Villa - A fabulous 280sqm villa, featuring a private swimming pool with a gazebo perfect for massages, surrounded by the sweet hibiscus scent - a symbol of purity in Hindu culture. 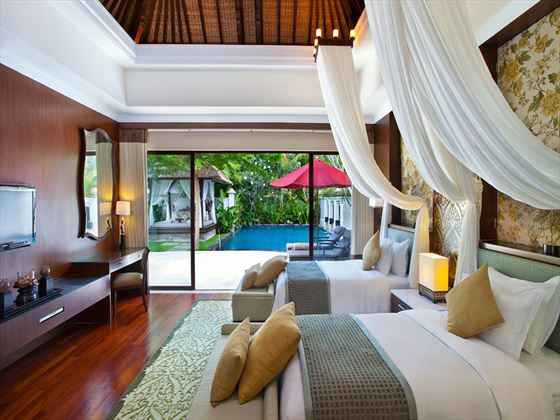 Villas feature a spacious living and dining room, king-size bedroom and a large ensuite with bathtub and separate shower. 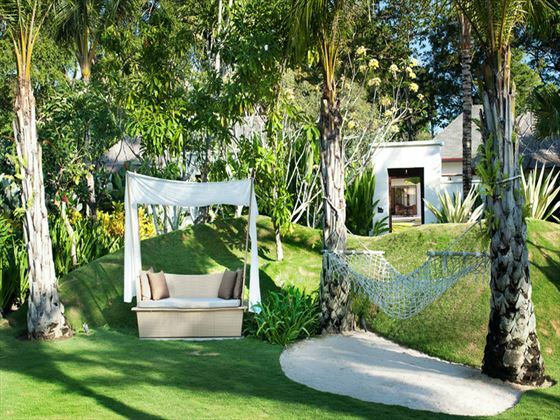 Guests will enjoy a buggy ride down to their private beach, where sun loungers and chairs await. One bedroom Villa - 360sqm, featuring a private pool and gazebo with an outdoor treatment room and massage table ensuring relaxation options are of the plenty. A 24-hour on call butler is available and guests can dine indoors or outdoors. The indoor dining is complete with a kitchen and a personal buggy service will transport guests to their private beach area where their sun beds await. 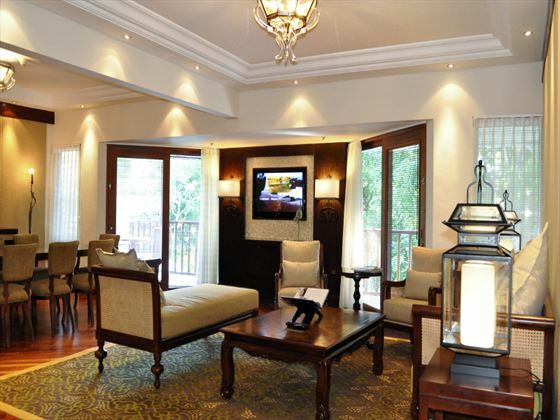 Two Bedroom Villa - 750sqm, featuring a master bedroom and second bedroom with two twin beds, a private outdoor pool and gazebo with an outdoor treatment room and massage table ensuring relaxation options are of the plenty. A 24-hour on call butler is available and guests can dine indoors or outdoors. The indoor dining is complete with a kitchen and a personal buggy service will transport guests to their private beach area where their sun beds await. Arwana - A gorgeous poolside restaurant serving delicious seafood delicacies, selected freshly from the markets each morning. KulKul Bar - A trendy bar serving cocktails, mocktails and light lunches, whilst looking out onto the sparkling ocean with a happy hour in the evenings. Opening times: 9am-12am. Dress code: Casual. Cornerstone - A delicious deli restaurant offering classic deli favourites, as well as homemade ice cream and vintage wines in their wine cellar. Opening times: 8am-10pm. Dress code: Casual. There are two beaches and one pool dedicated to children, providing young guests with a fun spot to splash around and cool off from the sun. Sorry, there are currently no prices available for your selected options. Please change your options or call us on 066 7164410 (Tralee) or 01 6649990 (Dublin) for a quotation. 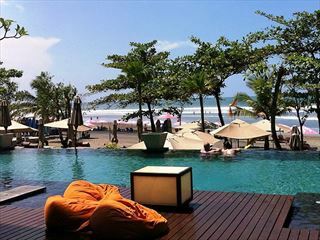 With the elegance and sophistication of a Balinese palace, but the modernity and convenience of a luxurious holiday, Nusa Dua Beach Hotel is perfect for those hoping for a stylish getaway. 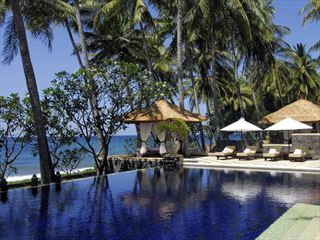 Nestled on the sun-kissed sands of Nusa Dua, the hotel oozes seclusion and tranquility.